Yesterday, we went to see Madeline & the Bad Hat with my MIL, then she took us to Chili's for lunch. 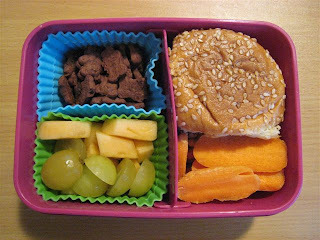 I had the little mini hamburgers and had some leftover, so I thought they would be the perfect addition for a bento. Just something a little different for a change and something I definitely can't make easily.